When we last met we talked about how obscenicons have degenerated to shifted keys on the keyboard. Now let's take a closer look at what they were before the keyboard invasion. Obscenicons now seem to be the typographic self-censorsing characters use for offensive and negatively valued words and expressions. Let's look at the graphics used to do the same thing. We can thank Mort Walker for the names here from his book Lexicon of Comicana. Quimps are mostly astrological symbols. Jarns are usually different types of spirals. 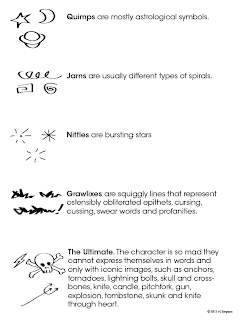 Grawlixes are squiggly lines that represent "ostensibly obliterated epithets, cursing, cussing, swear words and profanities." Finally, there is The Ultimate. 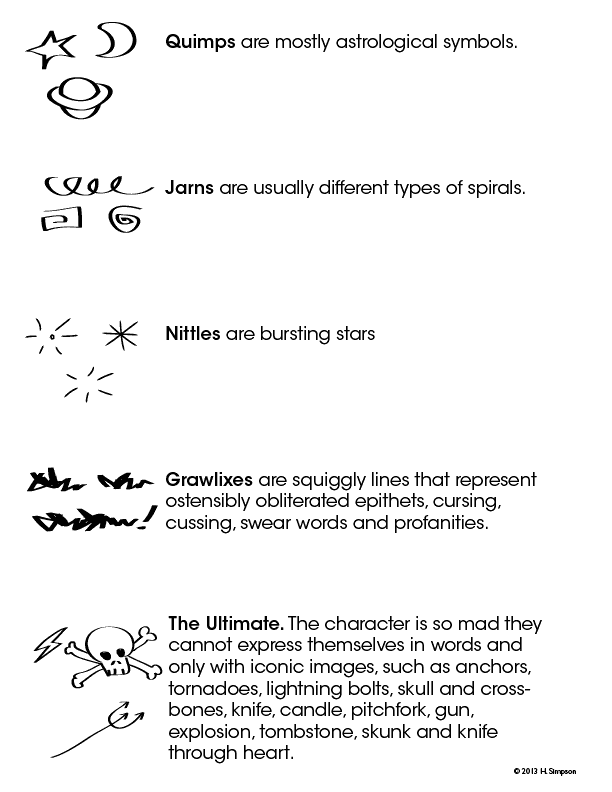 the character is so mad they cannot express themselves in words and only with iconic images, such as anchors, tornadoes, lightning bolts, skull and crossbones, knife, candle, pitchfork, gun, explosion, tombstone, skunk and knife through heart, etc. Your imagination is the limit. If you learned something today, share it with a friend. read next - The Attack of the Jargon!